"Sinbad" redirects here. For other uses, see Sinbad (disambiguation). "Having balanced my cargo exactly..."
Sinbad (or Sindbad) /ˈsɪnbæd/ the Sailor (Arabic: السندباد البحري‎, translit. as-Sindibādu al-Baḥriyy) is a fictional mariner and the hero of a story-cycle of Middle Eastern origin. He is described as hailing from Baghdad during the early Abbasid Caliphate (8th and 9th centuries CE). In the course of seven voyages throughout the seas east of Africa and south of Asia, he has fantastic adventures in magical realms, encountering monsters and witnessing supernatural phenomena. The tales of Sinbad are a relatively late addition to the One Thousand and One Nights – they do not feature in the earliest 14th-century manuscript, and they appear as an independent cycle in 17th and 18th century collections. The first known point at which they are associated with the Nights is a Turkish collection dated 1637. Traceable influences include the Homeric epics (long familiar in the Arabic-speaking world, having been translated into that language as early as the 8th century CE, at the court of the Caliph al-Mahdi), Pseudo-Callisthenes's "Life of Alexander" from the late 3rd/early 4th century CE via the 9th century "Book of Animals" of al-Jahiz, and, even earlier, in the ancient Egyptian "Tale of the Shipwrecked Sailor". Later sources include Abbasid works such the "Wonders of the Created World", reflecting the experiences of 13th century Arab mariners who braved the Indian Ocean. The Sinbad cycle is set in the reign of the Abbasid Caliph Harun al-Rashid (786–809). The Sinbad tales are included in the first European translation of the Nights, Galland's Les Mille et une nuits, contes arabes traduits en français, an English edition of which appeared in 1711 as The new Arabian winter nights entertainments and went through numerous editions throughout the 18th century. The earliest separate publication of the Sinbad tales in English found in the British Library is an adaptation as The Adventures of Houran Banow, etc. (Taken from the Arabian Nights, being the third and fourth voyages of Sinbad the Sailor. ), around 1770. An early US edition, The seven voyages of Sinbad the sailor. And The story of Aladdin; or, The wonderful lamp, was published in Philadelphia in 1794. Numerous popular editions followed in the early 19th century, including a chapbook edition by Thomas Tegg. Its best known full translation was perhaps as tale 120 in Volume 6 of Sir Richard Burton's 1885 translation of The Book of One Thousand and One Nights. Like the 1001 Nights the Sinbad story-cycle has a frame story which goes as follows: in the days of Harun al-Rashid, Caliph of Baghdad, a poor porter (one who carries goods for others in the market and throughout the city) pauses to rest on a bench outside the gate of a rich merchant's house, where he complains to Allah about the injustice of a world which allows the rich to live in ease while he must toil and yet remain poor. The owner of the house hears and sends for the porter, finding that they are both named Sinbad. The rich Sinbad tells the poor Sinbad that he became wealthy "by Fortune and Fate" in the course of seven wondrous voyages, which he then proceeds to relate. 16th-century depiction of a sailing port (Hormuz, present day Iran) in the Persian Gulf. After dissipating the wealth left to him by his father, Sinbad goes to sea to repair his fortune. He sets ashore on what appears to be an island, but this island proves to be a gigantic sleeping whale on which trees have taken root ever since the whale was young. Awakened by a fire kindled by the sailors, the whale dives into the depths, the ship departs without Sinbad, and Sinbad is saved by the chance of a passing wooden trough sent by the grace of Allah. He is washed ashore on a densely wooded island. While exploring the deserted island he comes across one of the king's grooms. When Sinbad helps save the King's mare from being drowned by a sea horse (not a seahorse as we know it, but a supernatural horse that lives underwater), the groom brings Sinbad to the king. The king befriends Sinbad and so he rises in the king's favour and becomes a trusted courtier. One day, the very ship on which Sinbad set sail docks at the island, and he reclaims his goods (still in the ship's hold). Sinbad gives the king his goods and in return the king gives him rich presents. Sinbad sells these presents for a great profit. Sinbad returns to Baghdad where he resumes a life of ease and pleasure. With the ending of the tale, Sinbad the sailor makes Sinbad the porter a gift of a hundred gold pieces, and bids him return the next day to hear more about his adventures. Sindbad the Sailor and the valley of the Diamonds. On the second day of Sinbad's tale-telling (but the 549th night of Scheherazade's), Sinbad the sailor tells how he grew restless of his life of leisure, and set to sea again, "possessed with the thought of traveling about the world of men and seeing their cities and islands." Accidentally abandoned by his shipmates again, he finds himself stranded in an island which contains roc eggs. He attaches himself to a roc and is transported to a valley of giant snakes which can swallow elephants (like the Bashe); these serve as the rocs' natural prey. The floor of the valley is carpeted with diamonds, and merchants harvest these by throwing huge chunks of meat into the valley: the birds carry the meat back to their nests, and the men drive the birds away and collect the diamonds stuck to the meat. The wily Sinbad straps one of the pieces of meat to his back and is carried back to the nest along with a large sack full of precious gems. Rescued from the nest by the merchants, he returns to Baghdad with a fortune in diamonds, seeing many marvels along the way. Impelled by restlessness Sinbad takes to the seas again and, as usual, is shipwrecked. The naked savages amongst whom he finds himself feed his companions a herb which robs them of their reason (Burton theorises that this might be bhang), prior to fattening them for the table. Sinbad realises what is happening, and refuses to eat the madness-inducing plant. When the cannibals have lost interest in him, he escapes. A party of itinerant pepper-gatherers transports him to their own island, where their king befriends him and gives him a beautiful and wealthy wife. Too late Sinbad learns of a peculiar custom of the land: on the death of one marriage partner, the other is buried alive with his or her spouse, both in their finest clothes and most costly jewels. Sinbad's wife falls ill and dies soon after, leaving Sinbad trapped in an underground cavern, a communal tomb, with a jug of water and seven pieces of bread. Just as these meagre supplies are almost exhausted, another couple—the husband dead, the wife alive—are dropped into the cavern. Sinbad bludgeons the wife to death and takes her rations. Such episodes continue; soon he has a sizable store of bread and water, as well as the gold and gems from the corpses, but is still unable to escape, until one day a wild animal shows him a passage to the outside, high above the sea. From here a passing ship rescues him and carries him back to Baghdad, where he gives alms to the poor and resumes his life of pleasure. (Burton's footnote comments: "This tale is evidently taken from the escape of Aristomenes the Messenian from the pit into which he had been thrown, a fox being his guide. The Arabs in an early day were eager students of Greek literature.") Similarly, the first half of the voyage resembles the Circe episode in The Odyssey, with certain differences: while a plant robbed Sinbad's men of their reason in the Arab tales, it was only Circe's magic which "fattened" Odysseus' men in The Odyssey. It is in an earlier episode, featuring the 'Lotus Eaters', that Odysseus' men are fed a similar magical fruit which robs them of their senses. "When I had been a while on shore after my fourth voyage; and when, in my comfort and pleasures and merry-makings and in my rejoicing over my large gains and profits, I had forgotten all I had endured of perils and sufferings, the carnal man was again seized with the longing to travel and to see foreign countries and islands." 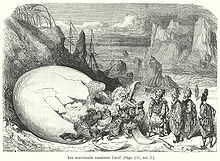 Soon at sea once more, while passing a desert island Sinbad's crew spots a gigantic egg that Sinbad recognizes as belonging to a roc. Out of curiosity the ship's passengers disembark to view the egg, only to end up breaking it and having the chick inside as a meal. Sinbad immediately recognizes the folly of their behaviour and orders all back aboard ship. However, the infuriated parent rocs soon catch up with the vessel and destroy it by dropping giant boulders they have carried in their talons. Eventually, Sinbad makes wine and tricks the Old Man into drinking some. Sinbad kills him after he has fallen off, and then he escapes. A ship carries him to the City of the Apes, a place whose inhabitants spend each night in boats off-shore, while their town is abandoned to man-eating apes. Yet through the apes Sinbad recoups his fortune, and so eventually finds a ship which takes him home once more to Baghdad. "My soul yearned for travel and traffic". Sinbad is shipwrecked yet again, this time quite violently as his ship is dashed to pieces on tall cliffs. There is no food to be had anywhere, and Sinbad's companions die of starvation until only he is left. He builds a raft and discovers a river running out of a cavern beneath the cliffs. The stream proves to be filled with precious stones and becomes apparent that the island's streams flow with ambergris. He falls asleep as he journeys through the darkness and awakens in the city of the king of Serendib (Ceylon, Sri Lanka), "diamonds are in its rivers and pearls are in its valleys". The king marvels at what Sinbad tells him of the great Haroun al-Rashid, and asks that he take a present back to Baghdad on his behalf, a cup carved from a single ruby, with other gifts including a bed made from the skin of the serpent that swallowed the elephant[a] ("and whoso sitteth upon it never sickeneth"), and "a hundred thousand miskals of Sindh lign-aloesa", and a slave-girl "like a shining moon". And so Sinbad returns to Baghdad, where the Caliph wonders greatly at the reports Sinbad gives of the land of Ceylon. 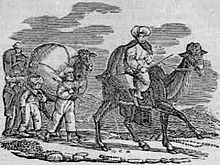 "The Caravan" from "Sinbad's Seventh and Last Voyage." The ever-restless Sinbad sets sail once more, with the usual result. Cast up on a desolate shore, he constructs a raft and floats down a nearby river to a great city. Here the chief of the merchants weds Sinbad to his daughter, names him his heir, and conveniently dies. The inhabitants of this city are transformed once a month into birds, and Sinbad has one of the bird-people carry him to the uppermost reaches of the sky, where he hears the angels glorifying God, "whereat I wondered and exclaimed, 'Praised be God! Extolled be the perfection of God!'" But no sooner are the words out than there comes fire from heaven which all but consumes the bird-men. 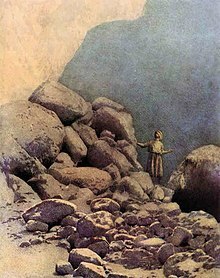 The bird-people are angry with Sinbad and set him down on a mountain-top, where he meets two youths who are the servants of God and who give him a golden staff; returning to the city, Sinbad learns from his wife that the bird-men are devils, although she and her father are not of their number. And so, at his wife's suggestion, Sinbad sells all his possessions and returns with her to Baghdad, where at last he resolves to live quietly in the enjoyment of his wealth, and to seek no more adventures. Burton includes a variant of the seventh tale, in which Haroun al-Rashid asks Sinbad to carry a return gift to the king of Serendib. Sinbad replies, "By Allah the Omnipotent, O my lord, I have taken a loathing to wayfare, and when I hear the words 'Voyage' or 'Travel,' my limbs tremble". He then tells the Caliph of his misfortune-filled voyages; Haroun agrees that with such a history "thou dost only right never even to talk of travel". Nevertheless, a command of the Caliph is not to be negated, and Sinbad sets forth on this, his uniquely diplomatic voyage. The king of Serendib is well pleased with the Caliph's gifts (which include, among other things, the food tray of King Solomon) and showers Sinbad with his favour. On the return voyage the usual catastrophe strikes: Sinbad is captured and sold into slavery. His master sets him to shooting elephants with a bow and arrow, which he does until the king of the elephants carries him off to the elephants' graveyard. Sinbad's master is so pleased with the huge quantities of ivory in the graveyard that he sets Sinbad free, and Sinbad returns to Baghdad, rich with ivory and gold. "Here I went in to the Caliph and, after saluting him and kissing hands, informed him of all that had befallen me; whereupon he rejoiced in my safety and thanked Almighty Allah; and he made my story be written in letters of gold. I then entered my house and met my family and brethren: and such is the end of the history that happened to me during my seven voyages. Praise be to Allah, the One, the Creator, the Maker of all things in Heaven and Earth!". In some versions we return to the frame story, in which Sinbad the Porter may receive a final generous gift from Sinbad the Sailor. In other versions the story cycle ends here, and there is no further mention of Sinbad the Porter. Sinbad's quasi-iconic status in Western culture has led to his name being recycled (as are virtually all names) for a wide range of uses in both serious and not-so-serious contexts, frequently with only a tenuous connection to the original tales. Many films, television series, animated cartoons, novels, and video games have been made, featuring Sinbad not as a merchant who happens to stumble into adventures, but as a dashing dare-devil adventure-seeker. Princess Dollie Aur Uska Magic Bag (2004–2006): Sinbad is a main character. Backyardigans (2007) episode: "Sinbad Sails Alone"
Sinbad et la légende de Mizan (2013) A French musical. Sinbad (film trilogy) (2015–2016) is a series of Japanese animated family adventure films produced by Nippon Animation and Shirogumi. Sinbad was mentioned, but did not actually appear, in the Season 3 episode "Been There, Done That" of Xena: Warrior Princess when one of the story's lovers tells Xena that he was hoping that Hercules would have appeared to save his village from its curse: "... or at least Sinbad." A pair of foreign films that had nothing to do with the Sinbad character were released in North America, with the hero being referred to as "Sinbad" in the dubbed soundtrack. 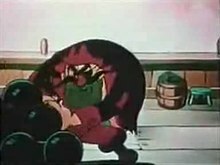 The 1952 Russian film Sadko (based on Rimsky-Korsakov's opera Sadko) was overdubbed and released in English in 1962 as The Magic Voyage of Sinbad, while the 1963 Japanese film Dai tozoku (whose main character was a heroic pirate named Sukezaemon) was overdubbed and released in English in 1965 as The Lost World of Sinbad. In Nikolai Rimsky-Korsakov's suite Scheherazade, the 1st, 2nd, and 4th movement focus on portions of the Sinbad story. Various components of the story have identifiable themes in the work, including Rocs and the angry sea. In the climactic final movement, Sinbad's ship (6th voyage) is depicted as rushing rapidly toward cliffs and only the fortuitous discovery of the cavernous stream allows him to escape and make the passage to Serindib. In The Count of Monte Cristo, "Sinbad the Sailor" is but one of many pseudonyms used by Edmond Dantès. In his Ulysses, James Joyce uses "Sinbad the Sailor" as an alias for the character of W.B. Murphy and as an analogue to Odysseus. He also puns mercilessly on the name: Jinbad the Jailer, Tinbad the Tailor, Whinbad the Whaler, and so on. Edgar Allan Poe wrote a tale called "The Thousand-and-Second Tale of Scheherazade". It depicts the 8th and final voyage of Sinbad the Sailor, along with the various mysteries Sinbad and his crew encounter; the anomalies are then described as footnotes to the story. Polish poet Bolesław Leśmian's Adventures of Sindbad the Sailor is a set of tales loosely based on the Arabian Nights. Hungarian writer Gyula Krúdy's Adventures of Sindbad is a set of short stories based on the Arabian Nights. In John Barth's "The Last Voyage of Somebody the Sailor", "Sinbad the Sailor" and his traditional travels frame a series of 'travels' by a 20th-century New Journalist known as 'Somebody the Sailor'. The song "Sinbad the Sailor" in the soundtrack of the Indian movie Rock On!! focuses on the story of Sinbad the Sailor in music form. Sinbad's adventures have appeared on various audio recordings as both readings and dramatizations, including Ali Baba and the Forty Thieves/Sinbad the Sailor (Riverside Records RLP 1451/Golden Wonderland GW 231, played by Denis Quilley), Sinbad the Sailor (Tale Spinners for Children on United Artists Records UAC 11020, played by Derek Hart), Sinbad the Sailor: A Tale from the Arabian Nights (Caedmon Records TC-1245/Fontana Records SFL 14105, read by Anthony Quayle), Sinbad the Sailor /The Adventures of Oliver Twist and Fagin (Columbia Masterworks ML 4072, read by Basil Rathbone), 1001 Nights: Sinbad the Sailor and Other Stories (Naxos Audio 8.555899, narrated by Bernard Cribbins) and The Arabian Nights (The Voyages of Sinbad the Sailor) (Disneyland Records STER-3988). Sinbad has made numerous appearances in comic books as well. In 1950, St. John Publications published a one shot comic called Son of Sinbad. In 1958, Dell Comics published a one shot comic based on the film The 7th Voyage of Sinbad. In 1963, Gold Key Comics published a one shot comic based on the film Captain Sinbad. In 1965, Dell Comics published a 3 issue series called Sinbad Jr. Also that year Gold Key Comics published a 2 issue mini-series called The Fantastic Voyages of Sinbad. Marvel Comics published a two issue series in 1974 based on the film The Golden Voyage of Sinbad in Worlds Unknown #7 and #8. They then published a one shot comic based on the film The 7th Voyage of Sinbad in 1975 with Marvel Spotlight #25. In 1977, the British comic company General Book Distributors, published a one shot comic/magazine based on the film Sinbad and the Eye of the Tiger. In 1988, Catalan Communications published the one shot graphic novel The Last Voyage of Sinbad. Malibu Comics published a 4 issue mini-series in 1989 called Sinbad, and followed that up with another 4 issue mini-series called Sinbad Book II: In the House of God in 1991. In 2001, Marvel Comics published a one shot comic that teamed Sinbad with the Fantastic Four called Fantastic 4th Voyage of Sinbad. In 2007, Bluewater Comics published a 3 issue mini-series called Sinbad: Rogue of Mars. 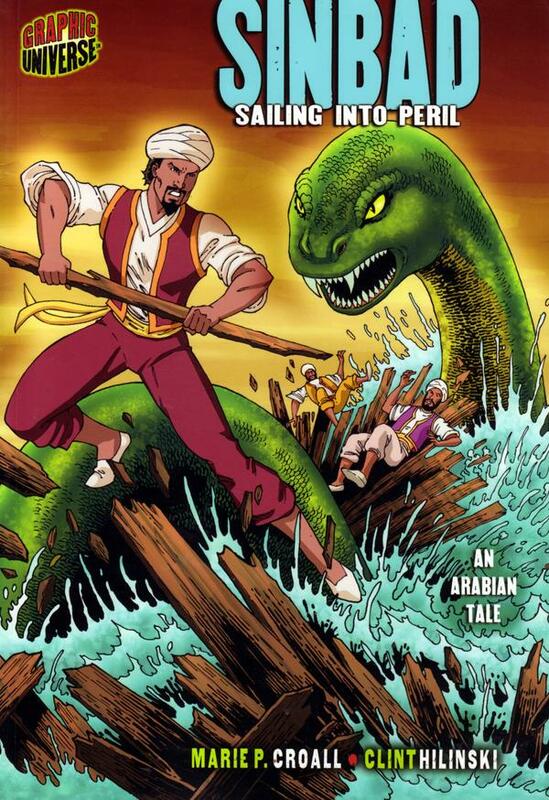 In 2008, the Lerner Publishing Group published a graphic novel called Sinbad: Sailing into Peril. Also that year, Zenescope Entertainment debuted Sinbad in their Grimm Fairy Tales universe having him appearing as a regular ongoing character. He first appeared in his own 14 issue series called 1001 Arabian Nights: The Adventures of Sinbad. Afterwards he appeared in various issues of the Dream Eater saga, as well as the 2011 Annual, Giant-Size, and Special Edition one-shots. In 2012, a graphic novel called Sinbad: The Legacy, published by Campfire Books, was released. He appears in the comic book series Fables written by Bill Willingham, and as the teenaged Alsind in the comic book series Arak, Son of Thunder—which takes place in the 9th century AD—written by Roy Thomas. In Alan Moore's The League of Extraordinary Gentlemen: Black Dossier, Sinbad appears as the Immortal Orlando's lover of thirty years, until he leaves for his 8th Voyage and never returns. "The Last Voyage of Sinbad" by Richard Corben and Jan Strnad originally appeared as "New Tales of the Arabian Nights" serialized in Heavy Metal magazine, issues #15–28 (1978–79) and was later collected and reprinted as a trade paperback book. In the Arabian Nights-themed video game Sonic and the Secret Rings, Sinbad looks almost exactly like Knuckles the Echidna. Sinbad provides the theme for Sinbad's Storybook Voyage at Tokyo DisneySea, for a roller coaster at the Efteling theme park at Kaatsheuvel, Netherlands, and for an elaborate live-action stunt show, The Eighth Voyage of Sinbad, at the Universal Orlando Resort in Florida. "Nagisa no Sinbad" (渚のシンドバッド) was the 4th single released by Pink Lady, a popular Japanese duo in the late 1970s and early 1980s. The song has been covered by former idol group W and by the Japanese super group Morning Musume. In 1978 Gottlieb manufacturing released a pinball machine named Sinbad, the artwork featured characters from the movie Sinbad and the Eye of the Tiger. Also released, in a shorter run, was an Eye of the Tiger pinball game. As well, Sinbad appears in the 1996 pinball game Tales of the Arabian Nights. This game (manufactured by Williams Electronics) features Sinbad's battle with the Rocs and the Cyclops as side quests to obtain jewels. The game was adapted into the video game compilation Pinball Hall of Fame: The Williams Collection in 2009. Sinbad appeared in various video games for the PC's in the 1980s, such as a 1984 game simply called Sinbad by Atlantis Software. A 1986 game called Sinbad and the Golden Ship by Mastertronic Ltd. Another 1986 game called The Legend of Sinbad by Superior Software. And a 1987 game called Sinbad and the Throne of the Falcon by Cinemaware. "Sinbad The Sailor" song appears in the Hindi movie Rock on!! Comedian David Adkins uses the stage name Sinbad. Sinbad plays an important role in the 2000 novel The Amazing Voyage of Azzam as the often mentioned but never seen rival of the glory seeking main character. Pulitzer Prize winner Steven Millhauser has a story entitled "The Eighth Voyage of Sinbad" in his 1990 collection The Barnum Museum. Sinbad is a major character in the ongoing manga series The labyrinth of magic – Magi (マギ) written by Shinobu Ohtaka. ^ The theme of a snake swallowing an elephant, originating here, was taken up by Antoine de Saint-Exupéry in The Little Prince. ^ Pinault 1998, p. 721-722. ^ The new Arabian winter nights entertainments. Containing one thousand and eleven stories, told by the Sultaness of the Indies, to divert the Sultan from performing a bloody vow he had made to marry a virgin lady every day, and have her beheaded next morning, to avenge himself for the adultery committed by his first Sultaness. The whole containing a better account of the customs, manners, and religions of the Indians, Persians, Turks, Tartarians, Chineses, and other eastern nations, than is to be met with in any English author hitherto set forth. Faithfully translated into English from the Arabick manuscript of Haly Ulugh Shaschin., London: John de Lachieur, 1711 . ^ The Adventures of Houran Banow, etc. (Taken from the Arabian Nights, being the third and fourth voyages of Sinbad the Sailor. ), London: Thornhill and Sheppard, 1770 . ^ Burton, Richard. "The Book of one thousand & one nights" (translation online). CA: Woll amshram. Retrieved 17 October 2011. ^ Marzolph, Ulrich; van Leeuwen, Richard (2004), The Arabian nights encyclopedia, 1, pp. 506–8 . ^ Irwin, Robert (2004), The Arabian nights: a companion . ^ "Shahnawaz Pradhan who plays Hariz Saeed in 'Phantom' talks about the film's ban in Pakistan". dnaindia.com. 22 August 2015. ^ "Son of Sinbad". Comics. Retrieved 17 October 2011. ^ "The 7th Voyage Of Sinbad Comic No. 944 – 1958 (Movie)". A Date In Time. Retrieved 17 October 2011. ^ "Captain Sinbad". Comics. Retrieved 17 October 2011. ^ "Sinbad Jr". Comics. Retrieved 17 October 2011. ^ "The Fantastic Voyages of Sinbad". Comics. Retrieved 17 October 2011. ^ "Worlds Unknown No. 7". Comics. 24 August 2006. Retrieved 17 October 2011. ^ "Worlds Unknown No. 8". Comics. 24 August 2006. Retrieved 17 October 2011. ^ "Marvel Spotlight No. 25". Comics. Retrieved 17 October 2011. ^ "The Comic Book Database". Retrieved 17 October 2011. ^ "The Last Voyage of Sinbad". Comics. Retrieved 17 October 2011. ^ "Sinbad". Comics. Retrieved 17 October 2011. ^ "The Comic Book Database". Comic Book DB. Retrieved 17 October 2011. ^ "Fantastic 4th Voyage of Sinbad". Comics. Retrieved 17 October 2011. ^ "Sinbad: Rogue of Mars". Comics. Retrieved 17 October 2011. ^ Comic vine, archived from the original (JPEG) on 12 November 2012 . ^ "1001 Arabian Nights: The Adventures of Sinbad". Comics. Retrieved 17 October 2011. ^ "Grimm Fairy Tales: Dream Eater Saga". Comics. Retrieved 13 July 2012. ^ "Grimm Fairy Tales 2011 Annual". Comics. Retrieved 13 July 2012. ^ "Grimm Fairy Tales Giant-Size 2011". Comics. Retrieved 13 July 2012. ^ "Grimm Fairy Tales 2011 Special Edition". Comics. Retrieved 13 July 2012. ^ "Sinbad: Legend of the Seven Seas". Comic Corner. Camp fire graphic novels. 4 January 2012. Retrieved 13 July 2012. ^ "Gottlieb 'Sinbad'". Internet Pinball Machine Database. IPDb. Retrieved 17 October 2011. ^ "Gottlieb 'Eye Of The Tiger'". Internet Pinball Machine Database. IPDb. Retrieved 17 October 2011. ^ "Internet Pinball Machine Database: Williams 'Tales of the Arabian Nights'". Ipdb.org. Retrieved 17 October 2011. ^ "Sinbad for ZX Spectrum (1984)". MobyGames. Retrieved 17 October 2011. ^ "Sinbad & the Golden Ship for ZX Spectrum (1986)". MobyGames. Retrieved 17 October 2011. ^ "Lemon – Commodore 64, C64 Games, Reviews & Music!". Lemon64.com. Retrieved 17 October 2011. ^ "Sinbad and the Throne of the Falcon – Amiga Game / Games – Download ADF, Review, Cheat, Walkthrough". Lemon Amiga. 23 August 2004. Retrieved 17 October 2011. Haddawy, Husain (1995). The Arabian Nights. 1. WW Norton. ISBN 978-0-393-31367-3. Pinault, D. (1998). "Sindbad". In Meisami, Julie Scott; Starkey, Paul (eds.). Encyclopedia of Arabic Literature. 2. Taylor & Francis. Beazley, Charles Raymond (1911). "Sindbad the Sailor, Voyages of". In Chisholm, Hugh (ed.). Encyclopædia Britannica. 25 (11th ed.). Cambridge University Press. pp. 141–142. This includes a detailed analysis of potential sources and comparable tales across contemporaneous and earlier texts. Marcelli, A; Burattini, E; Mencuccini, C; Calvani, P; Nucara, A; Lupi, S; Sanchez Del Rio, M (1 May 1998), Sinbad, a brilliant IR source from the DAPhiNE storage ring, 5 (3), J Synchrotron Radiat, pp. 575–7, doi:10.1107/S0909049598000661, PMID 15263583 . Mart, Stefan, Story of Sindbad The Sailor, DE .